It’s true. Occasions Art Director Brittney Guest described it best last month when she said a small corner of my desk often becomes a home for wayward plants. Oddly enough, I can’t really tell you why. 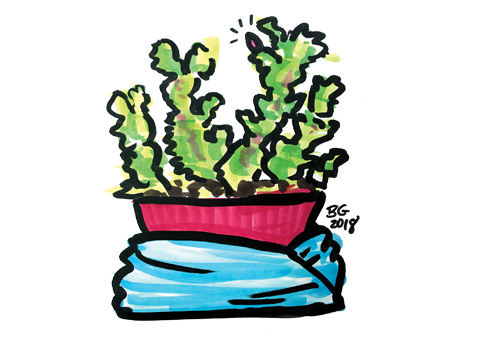 A few weeks ago, I was watering plants scattered randomly across the office when I spotted a small Christmas cactus that had been tucked away out of sight. The cactus had been given to a staff member last December on her birthday. My guess is that the cactus was looking sickly and so the unnamed staff member decided to hide it near the baseboard in the foyer while it died a slow, natural death. By the time I found it, the cactus was in pretty bad shape. It was wilting and its glossy branches had turned a sickly shade of green with no blooms in sight. With a little TLC, I thought, I might be able to revive it in time for the holidays. I picked it up, watered it and placed it under a lamp on the corner of my desk. Within a few days, it had perked up and was looking like it might have a little life left in it after all. About that time, the plant’s rightful owner noticed it on my desk and apologized for abandoning the cactus. No worries, I assured her. I just enjoyed the challenge of attempting to revive it. For me, wayward plants serve as a miniscule distraction during the course of my workday. In the middle of paying bills, responding to an onslaught of email or editing copy, I see the Christmas cactus on the corner of my desk and stop for a minute to see how it’s doing. Even if it needs attention, it only takes two or three minutes out of my day. In that short amount of time, my attention is diverted to something more peaceful, which has a very calming effect. Don’t get me wrong; there are a multitude of things that stress me out during the course of a day, plants just don’t happen to be one of them. If they did, I, too, would try to bury it near the baseboard. As for the most recent wayward plant to find refuge on my desk, it may look like the poster plant for a Charlie Brown Christmas cactus, but it is making strides. A few days shy of December, it managed to sprout one teeny tiny pink bloom just in time for the holidays.